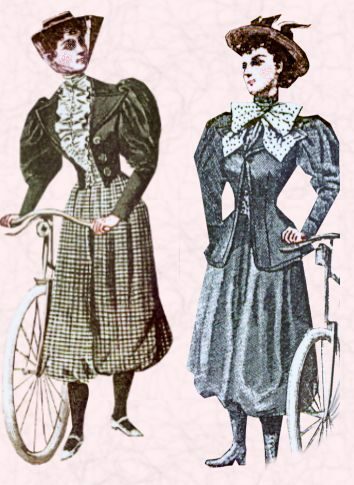 In the 19th Century it was improper for women to ride a bike, because while riding the dress was going up letting others to see too much of the ankles. Just a few women had the courage for bike riding and one of them was Lady Harberton, the wife of the British Viscount, the President of the Western Rational Dress Society and an enthusiastic cyclist. The Western Rational Dress Society protested against the wearing tightly fitted corsets deforming women’ body, against the heavily weighted skirts, impeding the body moves, they proposed all women to put on more comfortable dresses. Lady Harberton for her bike rides was wearing bloomers, jackets and shoes without heels. At those times, women dressed this way were treated like prostitutes, they were not served in restaurants and were not allowed to enter shops. There is a documentary proof, dated 1898, describing that after a long bike ride Lady Harberton, dressed boldly in bloomers and a jacket, stopped for a lunch in one of the hotels, however she was refused to enter the restaurant for such an indecent dress. The Cyclists’ Touring Club (still exists) tried to sue the hotel for refusing food to a traveler, but lost the case. However, all those cases did not stop Lady Harberton and she continued to wear rational dresses and to ride a bike. Thankfully nowadays we can ride a bike as we like! Ladies in shorts, skirts, dresses, trousers are always welcome on our Milan bike tour through secret gems of the city!